If you were following our stories and posts on Instagram then I am sure that you already know about our recent trip to Goa. We stayed in Goa for 10 days and tried different hostels and guesthouses during our time here. One such place which we tried as a part of the Stay On Skill tribe is The Noname Guesthouse in Arambol. Full Disclosure: This was a collaboration with the guesthouse so we got 3 nights 4 days of free stay in return for our honest review. And so, we would like to mention that if you are looking for some comfort without breaking your bank then The Noname Guesthouse is the perfect place for you. This is a great place for solo travelers, couples, families, and digital nomads as well. Also, if you are looking for a few Offbeat places to visit in Goa, then you can check out our other article. Located in Arambol, The Noname Guesthouse is a venture by Alex and Vera who love to meet new people and offer them a comfortable and relaxed stay at their guesthouse. And one of the best things about this place is that it has such a friendly and hippy vibe so you can relax and work or just chill here. The rooms are nicely decorated and were done by the owners and their family as they believe in self-work. You will find here soft lighting and beautiful paintings and colorful accessories lining the rooms of the wall. The guesthouse has multiple floors with separate floors for kitchen, rooms, and co-working space. The kitchen is in an open-room terrace and has several books and games to keep you occupied. Here, you will also find toys for kids to keep them occupied which makes it the perfect place for families as well. And this is the place where you will be presented with a delicious home-made vegetarian meal for breakfast. You also have a co-working zone on the rooftop where you are provided with tables and chairs to work peacefully. And the high-speed WiFi ensures that you work uninterrupted while enjoying the surrounding views. The Noname Guesthouse is located on the beachside in Arambol which makes it one of the center points of Arambol. Just walk for 5 minutes to reach the Arambol beach and enjoy meals in one of the cafes there or you can simply take a dip in the ocean. Surrounded by numerous cafes and restaurants, The Noname Guesthouse has easy access to other places for a good meal and a great nightlife. 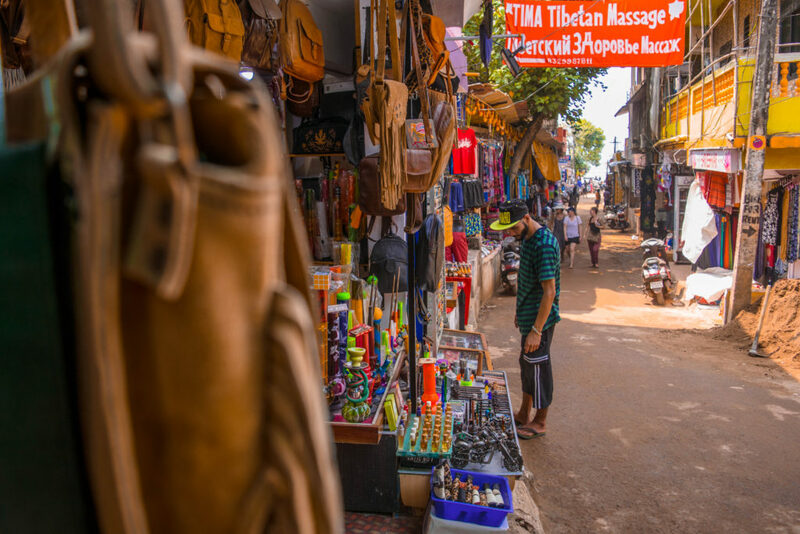 Apart from the several cafes, this place is also located right next to the Arambol market where you can purchase some gorgeous souvenirs for yourself. But that is not all, you are also close to some of the major attractions in Arambol like the Sweet Lake water, Arambol beach, Querim Beach, Dando bridge, and so on. 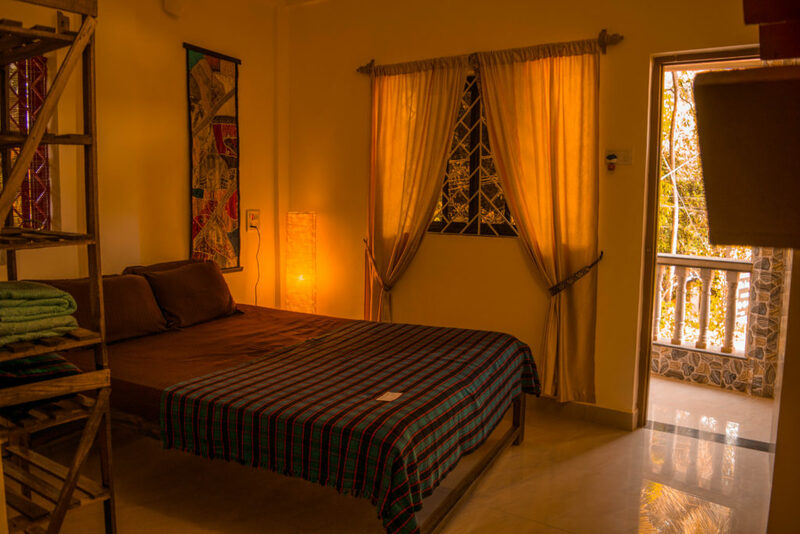 So, if you are planning to just relax for a few days and explore only the North Goa then The Noname Guesthouse is the perfect place for you to stay. If you still aren’t convinced about why you should stay at this guesthouse, then here are a few reasons to do so. 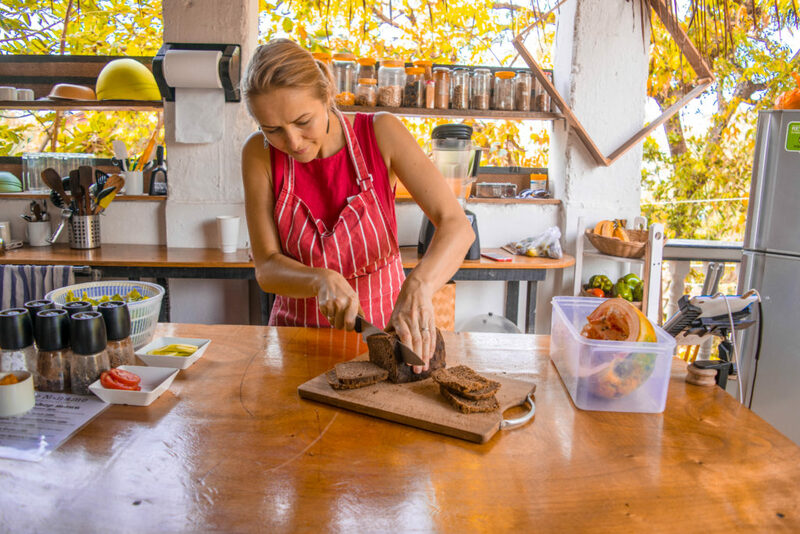 One of the best things about this guesthouse is that you get homemade vegetarian options which are healthy and delicious. 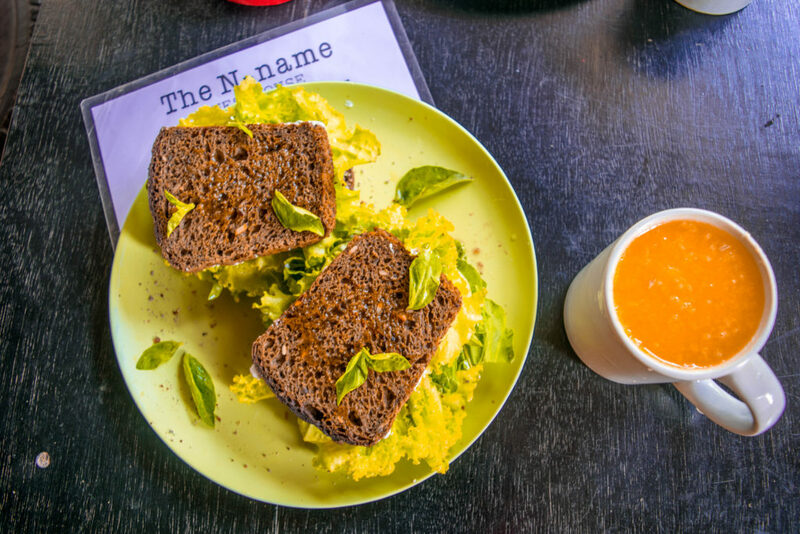 Vera makes the bread herself so you always get fresh breakfast to enjoy and the juice made here is fresh and sugar-free. Also, most of the things used in cooking are organic or prepared by them so, the breakfast tends to be filling and healthy. You also have an option to choose a set of the meal along with two beverages for 450 INR. So, you can choose between omelets, sandwiches, fruit bowls, and so on and get a cup of coffee/tea along with a glass of juice. And trust us, this is more than enough to get you by for the next 5-6 hours. Another reason to choose The Noname Guesthouse is that they also have a Co-working space available for digital nomads to work in. So, if you are on a long vacation and want to get some work done or if you are a digital nomad who needs constant WiFi to work, then this place is the ideal choice for you. The rooftop Co-working space is quiet and peaceful and allows you to concentrate on your work while breathing in the fresh sea air around you. Also, you get free WiFi access at a standard speed for daily use. If you want a higher speed connection then you can pay extra (approximately 150 – 300 INR) for a day for better WiFi access. The Noname Guesthouse contains spacious and well-lit bedrooms which look beautiful during the nighttime. And the walls of the rooms are decorated with shelves, paintings, and so on. The rooms are clean and properly arranged so you have space to move around easily and store your luggage. And a few rooms also have a balcony attached to it so you can enjoy the market and cafe views while sitting in your balcony. 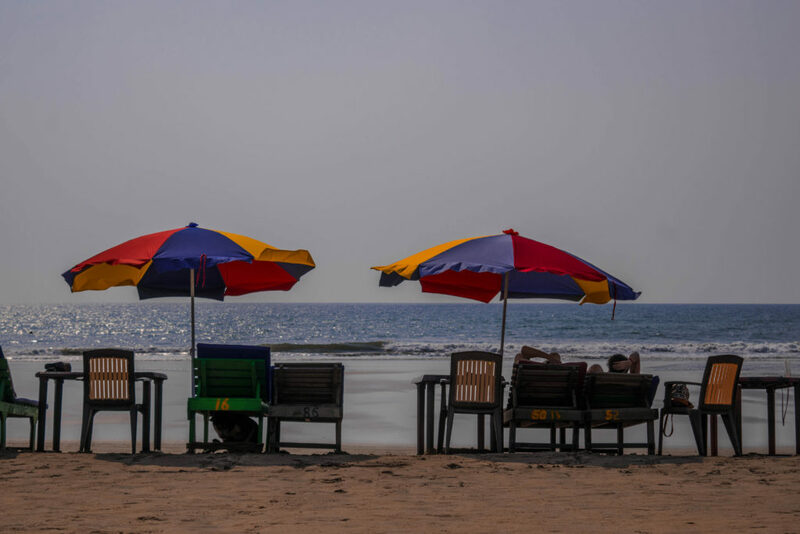 Since this place is located next to the Arambol beach, you are close to many important sightseeing places like the Querim beach, Sweet Water Lake, Arambol cliffs, beachside, marketplace, and so on. Everything is at a walking distance so you don’t have to travel much to explore. And in the evening, you can also enjoy activities on the beach like drum playing, singing, dancing, and so on. You also get to witness the most amazing sunsets from the rooftop of this guesthouse as one can see the ocean from here itself. Lastly, you have the most amazing hosts to plan your Goa trip and learn about the places that you can explore here. Alex is kind and helpful and will give you detailed directions to reach all the major attractions here. Apart from that, they will also ensure that you utilize your time fully here and will suggest you activities and offbeat places that you could probably explore here. There are 4 types of room options available at the Noname Guesthouse which you can choose from. This will depend on the number of people you are traveling with and whether you are looking for a budget-friendly room or a luxurious room. Perfect for solo travelers who want a private room to get back to after partying is the Standard Single Room of the Noname Guesthouse. This room offers you a double-sized bed which offers you a lot of bed space to roll around and relax in. And you also get complimentary towels, toiletries, and free WiFi access along with it. And one of the best things about this room is that you get a good window view so you have a lot of light and fresh air coming in during the daytime. The room rate for this room also includes your breakfast so you can be sure to have a fulfilling and enjoyable morning meal. For solo travelers who are looking for a cheaper stay option, Economy Single Room is the best option. 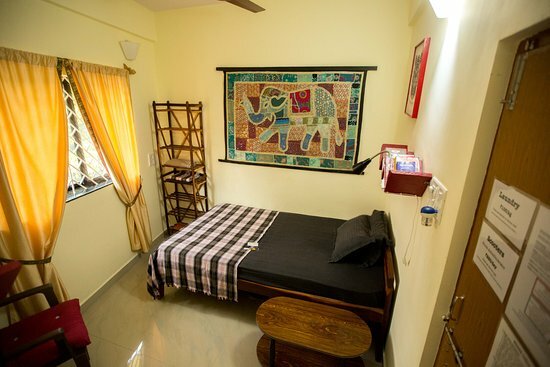 This room includes all the basic amenities of a Standard Single Room except for the fridge. And you have a Single-sized bed in this room, not a double-sized bed. Also, the window of this room faces the wall of a building so you don’t get much sunlight or fresh air inside the room. For couples and families, the Standard Double Room is the best choice as it includes 1 king-size bed that can easily accommodate 2 people. This room also includes a balcony which offers you the view of the Arambol beach market. Apart from that, you also get free WiFi, breakfast, fridge, and the basic amenities which are offered with other room options. If you are a family of two or three who are looking for a more economical option then the Economy Double Room is the right choice for you. Although this room doesn’t offer a balcony or a fridge, it does offer a Super-King sized bed which is comfortable and fits 3 people easily. We stayed in The Noname Guesthouse for 3 days in the Standard Double Room and had the best time here. The rooms were so comfortable and homely that we slept like a baby here. And the balcony was a great way to get acquainted with our surrounding markets and cafe during our stay here. Alex and Vera were extremely accommodating and made sure that we were comfortable and well-cared for during our stay. We reached late at night but they were all smiles and showed us the room to rest in for the night. Next day, they served us with the most delicious (and healthy) breakfast which was filling and kept us energized for the next few years. They also told us about the places that we can explore nearby and how to reach the Sweet Water Lake, Cliffside, Arambol mountain, and so on. Alex is a great and helpful guy and is always smiling at you, which is really reassuring. 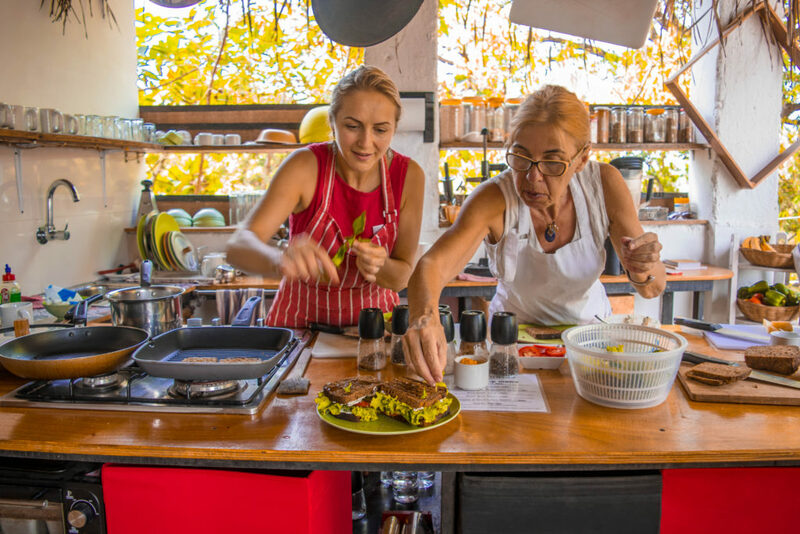 And Vera is a sweetheart as she converses with you and cooks the most delicious vegetarian meals ever. Frankly, we couldn’t have chosen a better place for our stay as we just relaxed and chilled on the beachside. We just walked on the beach, explored the local market, and watched the sunset in one of the most happening beaches of Goa. Arambol has its own hippy vibe which is completely different from the rest of the Goa so staying in The Noname Guesthouse was a great experience for us. So, if you are planning for an easy-going vacation in North Goa, then do stay here. And do let us know in comments if you end up staying there! Let us know about your experience too!